If you love cross stitch, crochet, needlepoint, embroidery, fly fishing, or any creative technique in between, bookmark www.kreinik.com to visit often for free project ideas. We will post new designs each month in the Freebies section to help you use your thread stash, make gifts, decorate your home, entertain kids, teach friends, or simply relax with a project. We share inspiring ideas, projects that can be made quickly, and some of the best designers in the creative community. One of the featured projects this month is a cute door sign or away message. Now you'll know if your little (or grown-up) zombie is in or out. Hang it on a doorknob or a computer. The bat-shaped felt piece came from a craft store's Halloween section, but you can make any shape. The sign is made in no-time thanks to Kreinik Iron-on Threads (and we used glow in the dark colors). What, you've never heard of iron-on threads? They couldn't be any easier - you get the look of thread embroidery in less time; the fiber has a heat-activated adhesive that sticks to a surface when you use an iron. Don't believe how easy that sounds? Watch this video as we make the Zombie Away Message. Visit www.kreinik.com/shops/Freebies/ to find hundreds of free projects. Enjoy! While your iron is cool, cover the plate with the Adhesive Press Cloth. This surface will keep the adhesive in the thread from sticking to your iron. Some household irons are already coated with non--stick surface, but most craft irons are not coated. Turn on your iron to the highest heat setting and let it heat thoroughly. Using the template as a guide, trace or copy the words onto each side of the felt bat piece. Using one color of iron-on thread per word, begin ironing. 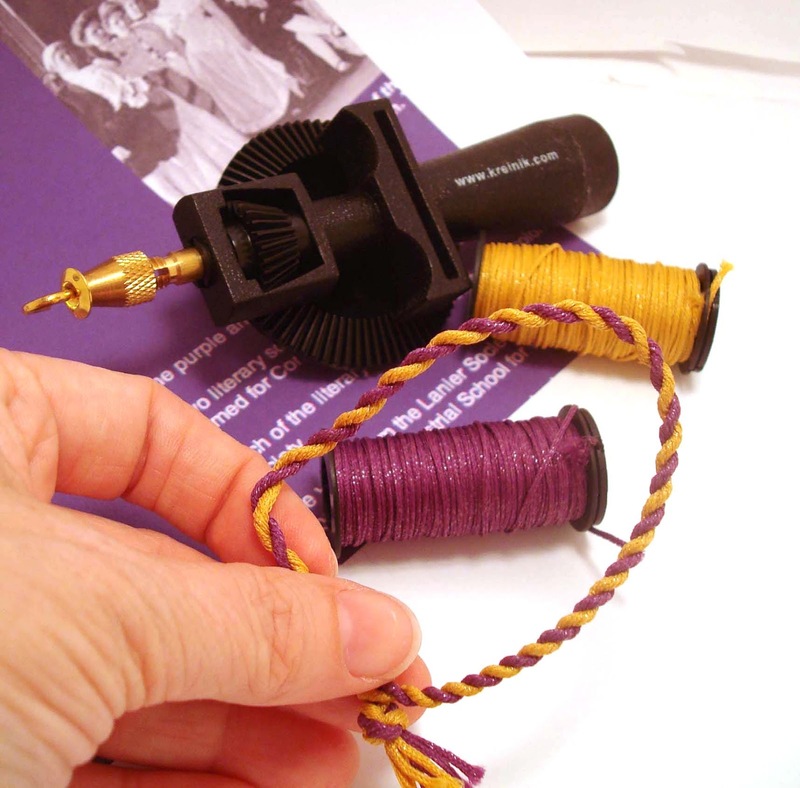 Put the thread at a starting point, cover with your hot iron, and hold for several seconds until the thread adheres. Continue working this way as you iron on the thread in your design. Make cording using the Custom Corder, following the directions that come with the tool, using the black and white Braid. Sew to your felt bat to be a hanger. The headline on BuzzFeed caught our attention: "These Close-Ups Of “Game Of Thrones” Fashion Will Take Your Breath Away: The level of detail is staggering. Costume embroider Michele Carragher takes her job very seriously." Here at Kreinik, we are fans of many shows and movies, and get excited to see a needlepoint pillow on a set, or see a movie star knitting. 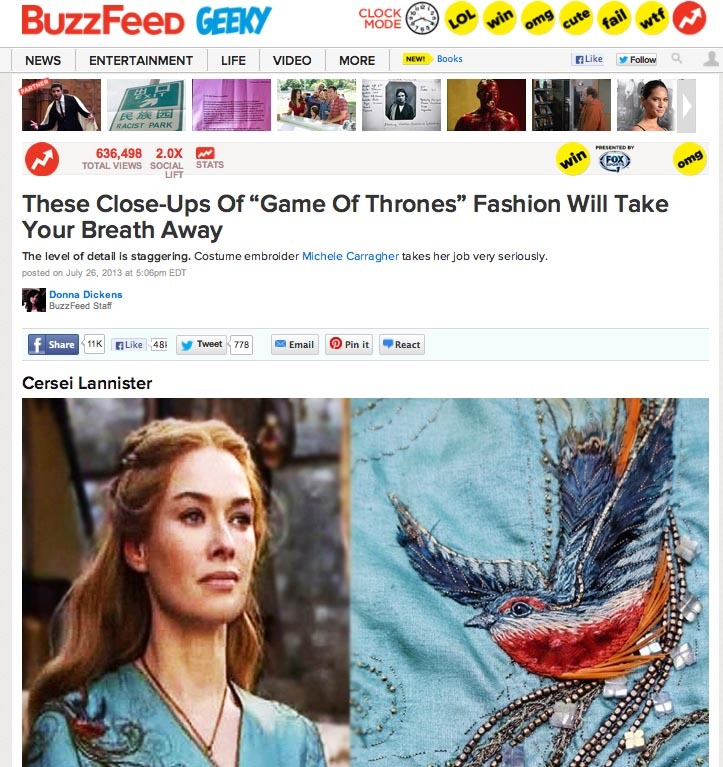 The Buzzfeed article, however, takes you closer than ever before to Textiles-On-TV: straight to the detailed embroidery work on costumes worn by Game of Thrones actors. Three cheers for embroidery! We all know how cool embroidery is, right? Now the world can see it too. Read Donna Dickens' article on BuzzFeed when you have a chance, and look at the stunning embroidery work. At the end of the article, there is a link to the costume designer's website, where you will find additional photos of gorgeous costumes, fiber art, and embroidery. 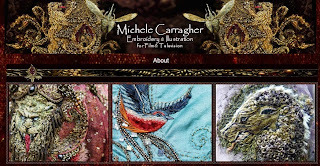 Even more, the designer, Michele Carragher, shares videos of how she makes certain embroideries for the show. This is must-see internet-tv for all needleworkers. Michele has worked on costumes for tv and movies for 15+ years (specializing in hand embroidery and surface embellishment), and has an extensive background in historical textiles and restoration work. We can all learn a lot from Michele. She is really nice, too, which we found out when we contacted her. It is truly a blessing to see up-close work of a talented needle artist, but also to have her show you step-by-step how the work is created. You will recognize some of the stitches she uses and the designers who influence her work. You probably own some of the same needlework books that she has in her studio. 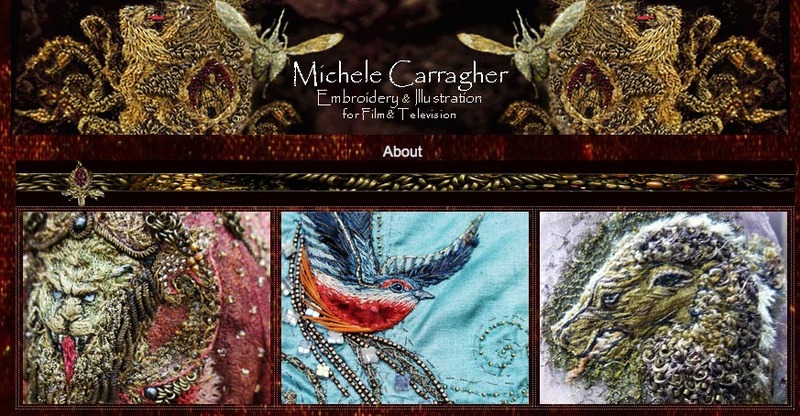 From looking at her website and viewing her tutorials, you feel connected to Michele through the fellowship of embroidery, and extremely proud that needlework made it to the big time like this. A quick search of "Game of Thrones costumes" on Twitter reveals a bunch of people who want to be Michele (and a bunch of people dressing like GOT characters for Halloween this year). This costume designer from London is bringing needlework to the masses in a very creative, fun, and HBO way. To make a long blog shorter, we contacted Michele to tell her how much we admired her work and to thank her for sharing tutorial videos for needleworkers. Her assistant wrote to us, "I have passed your email onto Michele, she will personally reply to your email at the weekend...she very busy working away from her London base in Belfast on Game of Thrones season 4." Oh, how cool. Michele contacted us when she had a chance, and said she has used Kreinik metallic threads on the embroidery in the costumes. "WOW, COOL," was the collective shriek from Kreinik staff. Catch Season 2, for example, and zero in on the insects which were created with Kreinik metallics. Michele's assistant, Franco, sent a video of one of these insects for us to share with everyone. Thank you Franco and Michele! Here is a link to the clip in which Kreinik threads are used in the details to recreate a grasshopper. Note: this isn't a real bug - it's embroidered! Michele commented to us, "Thank you for visiting my site and I am glad you enjoyed it, apart from being my Online Portfolio for my film work I hope that it encourages others to embark on embroidery projects of their own, be they great or small." What wonderful inspiration for needleworkers of all levels and all ages. Spend some time on Michele's site today. Be sure to look at how she created the effect of dragon scales on a dress. Let's hear it for embroidery! I jumped at the chance to attend Maker Faire Detroit, which was held in Dearborn, Michigan July 27-28. It is a relatively short drive from our thread factory, and I knew it would be fun. I have been to Maker Faires in the past and found them to be some of the most exciting creative festivals in the country. First, about the venue… If you have never been to the Henry Ford Transportation Museum and Greenfield Village, you will be in for a treat. The Museum is divided into segments: Trucks and Automobiles, Clocks, Machinery, Trains, Farm Equipment and the history of what happened to the world after the automobile became mass-produced at a very reasonable price. Henry Ford changed the world. You could literally spend at least two full days walking through the museum and the village and learn a lot. Now, about the Faire… The TNNA (National NeedleArts Association) sponsored a "Needlearts Zone." This how-to center could be found amongst the museum's antique planes and automobiles. We had teachers instructing newbies in knitting and crochet (both right and left handed), needlepoint, cross stitch and spinning. Even though I have stitched and have always been around these arts, I am not the greatest stitching instructor, so I spent my time directing people into the learning area and making friendship bracelets using the Kreinik Custom Corder and Kreinik threads. I made over 100 friendship bracelets with people over the two days of the Faire, and it was fun. 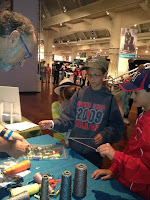 The bracelets were definitely a crowd pleaser, especially for kids. Maker Faire occurs in a variety of cities including Detroit, NYC and San Mateo. It attracts computer geeks and crafting geeks who just want to learn something new. We handed out lists of yarn and needlework shops found in the surrounding states that belong to the TNNA association. Detroit’s Faire attracted at least 8000 people. There were young boys and girls and men and woman who sat and stitched. We even had Batman and Princess Leia learning to knit, and a Sith desiring to learn how to spin yarn. It just shows that crafting is universal.